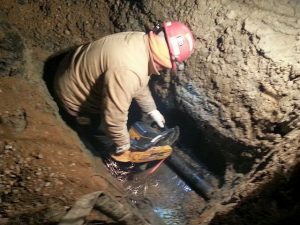 If you are currently experiencing issues with the sewer system at your residential, commercial, or industrial real estate in St. Charles, Missouri then you are certainly not alone. Many properties in the area were built quite a while ago, perhaps long before you were even born. The average lifespan of the older sewer pipes that were installed when your property was built is approximately forty years. The fact is, the materials that the pipe manufacturers used are significantly inferior when compared to today’s standards. For example, cast iron was the standard type of sewer pipe used for numerous years. The metal is extremely strong, however, it rusts when exposed to water. That is certainly not a good situation since sewer pipes are exposed to groundwater and the wastewater that flows through them on a constant basis. Over time the rust spots turn into rotten spots, which lead to holes, and breaks within the sewer pipeline. Cast iron was eventually replaced with clay. Although clay does not rust or corrode when exposed to water and is great at containing both liquids and solids it is an extremely fragile material. For example, what happens when you drop a clay flowerpot, or pretty much anything that is made out of clay? It shatters into a bunch of fragmented pieces. The same thing basically happens to the clay sewer pipes. Over time the vibrations and movements in the earth weaken the pipes to the point where they chip, crack, shatter, and break. Once the cast iron or clay sewer pipes are compromised you will begin to notice problems. At first, you may smell sewer gas in or around your home, place of business, or investment property. You may also notice that puddles are forming in the yard or grounds even when it has not rained. The toilets and drains will begin to work slower than usual and will eventually clog. In a worst-case scenario raw sewage, wastewater, and waste materials will back up into the system and enter into the property through the toilets, water faucets, sink drains, shower drains, and tub drains. It is extremely important to contact an experienced plumbing contractor, like Nu Flow Technologies, as soon as you begin to experience any of the signs listed above. We specialize in sewer repair and will be able to accurately diagnose the problem with your sewer system. In addition, our company offers the Nu Flow trenchless pipe lining method, which is by far the most cost-effective, fastest and least destructive sewer repair procedures available on the market. If any of the tell-tale signs as listed above are happening at your property then please contact us today for a free estimate. Problems with the sewer system simply do not go away on their own and must be dealt with in a timely manner in order to avoid a sewer related disaster. Nu Flow Technologies has been in the trenchless sewer repair business for close to twenty years. We have been an industry innovator since the very beginning. We have even helped develop the machines, materials, and processes that have made trenchless sewer repair the number one choice for property owners across America and even the world.